The black bear is the only bear species still found in Arizona. It is the smallest and most widely distributed North American bear. It lives in most forest, woodland and chaparral habitats, and desert riparian areas. 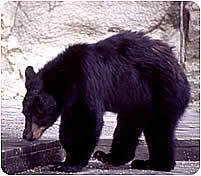 Black bears generally roam an area of 7 to 15 square miles. Conflicts associated with black bears include public safety concerns and possible property damage. Most conflicts are the result of people unintentionally feeding bears, most often by allowing them access to household garbage or bird feeders. They raid dumpsters, garbage cans and grills looking for an easy meal. They might enter a building by breaking screen doors and windows to look for food they smell. Although uncommon, black bear attacks on humans occasionally occur, especially in areas where they come into frequent contact with people and their food. Bears may visit areas of human use because they find food. Food can include unsecured garbage, birdseed, pet food, fruit trees and some gardens. Drought, wildfire and urban development can cause bears to roam farther in search of new food sources. Young bears sometimes travel long distances in search of an area not already occupied by another bear. Black bears should always be considered unpredictable and potentially dangerous. A black bear will usually detect you and leave the area before you notice, unless the bear has been conditioned to people and their food. If you live in black bear country, take responsibility for not attracting them. Always work with your neighbors to achieve a consistent solution to the problem situation, and keep in mind that doing a combination of things is better than doing just one. If a black bear attacks, fight back with everything in your power – fists, sticks, rocks and E.P.A. registered bear pepper spray. Arizona Game and Fish Department personnel remove bears that present an imminent threat to human safety or when they are in a situation where they cannot safely escape on their own. Call 911, your local Arizona Game and Fish Department office, or Arizona Game and Fish Department Radio Dispatch at (623) 236-7201. Bears can be common at high elevations where food is plentiful. Different bears will visit the same area if attractants are not removed. Bears that must be removed are relocated or may have to be destroyed if they are considered too dangerous, have lost their fear of humans, or continue to get into conflicts with people. Removing any wild animal is traumatic for the animal, and usually can be prevented. Follow the tips below to allow bears and humans to coexist while avoiding negative interactions. Don't feed or give water to black bears. Be aware that human behaviors, such as feeding other animals, can attract black bears. Fences, lighting and dogs have not been found to be effective, long-term detterents. Bears are good climbers, so to reduce a bear's ability to get over a fence, it should be at least 6 feet tall and constructed of non-climbable material. Canine distemper — This viral disease consists of fever, loss of appetite, coughing, and eye and nose discharge. Black bears are top-level predators capable of killing or seriously injuring humans, and the department is committed to public education to help people learn how to behave responsibly and live safely in proximity to bears. Black bears are classified as big game animals. They may not be killed without a valid hunting license except in self-defense or where livestock has been killed. See Arizona Game and Fish Department Hunting Regulations. State law prohibits firing a gun within a quarter-mile of an occupied residence or building without the permission of the owner. Check your local city ordinances, but most cities ban shooting firearms within city limits. Some cities ban the use of slingshots, BB guns, air guns, or bows. Refer to ARS-17-239 on wildlife depredation and Arizona Game and Fish Department Hunting Regulations for more information.